Flexibility in your back is important for many sports, including gymnastics, figure skating, and dancing. Increasing your flexibility can only be accomplished over time and can be a challenging task, depending on your body type. Stretching your back, along with other muscles that work in tandem with your back, is the best way to improve overall flexibility. Many yoga poses also incorporate these kinds of stretches. Note: Remember to consult a physician before attempting any new workout program; what is appropriate for one person may be hazardous for another. Get professional guidance in attempting these poses, as there are safety protocols to prevent injury. Remember to properly warm up before attempting these stretches, as these poses can be a risk of injury if attempted without loosening up first. Try a bow pose. While lying flat on your stomach, bend your knees so that your feet point up toward the ceiling and reach behind you to grab your ankles. Lift up with your arms and feet to feel a nice stretch in your shoulders and abs. 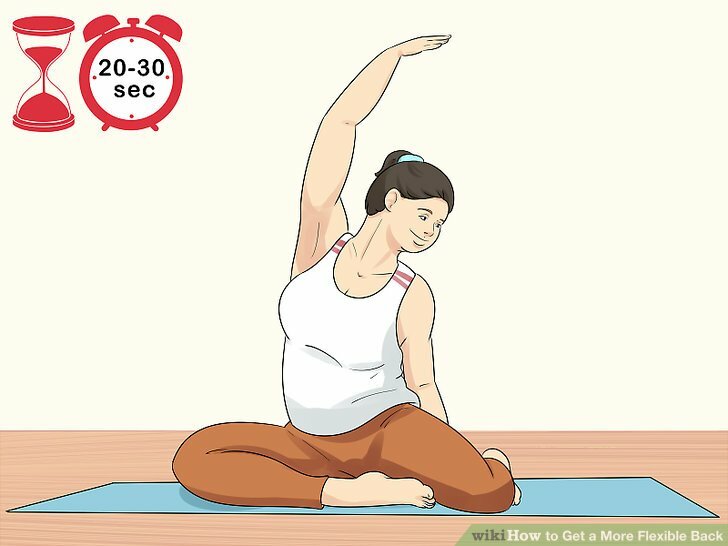 Hold the pose for 20-30 seconds, then exit the bow pose on an exhale breath. 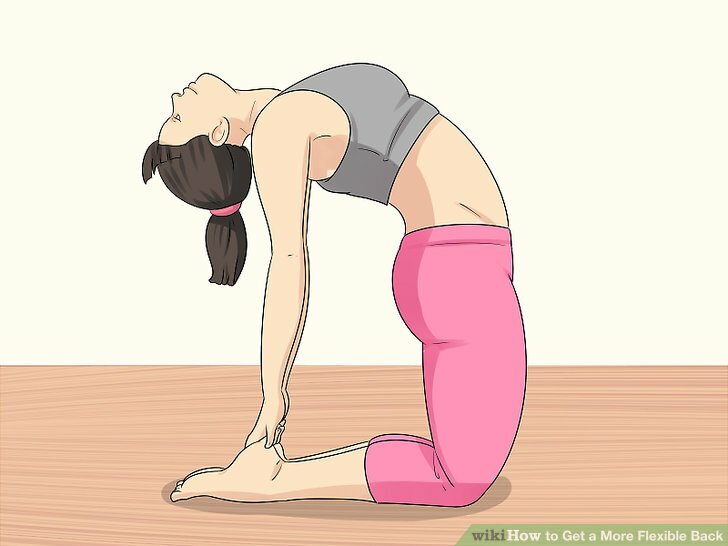 You may repeat the pose several times for better results. Once your body adjusts to this level of stretching, a more advanced move would be to reach farther up and grab the tips of your toes. This will pull your legs more upward toward the ceiling, and stretch all of the muscles being used even further. Try a cat stretch. Get on all fours with your palms flat on the ground and your legs hip-width apart. As you inhale, tilt your head back toward the ceiling and push your bellybutton down towards the ground. 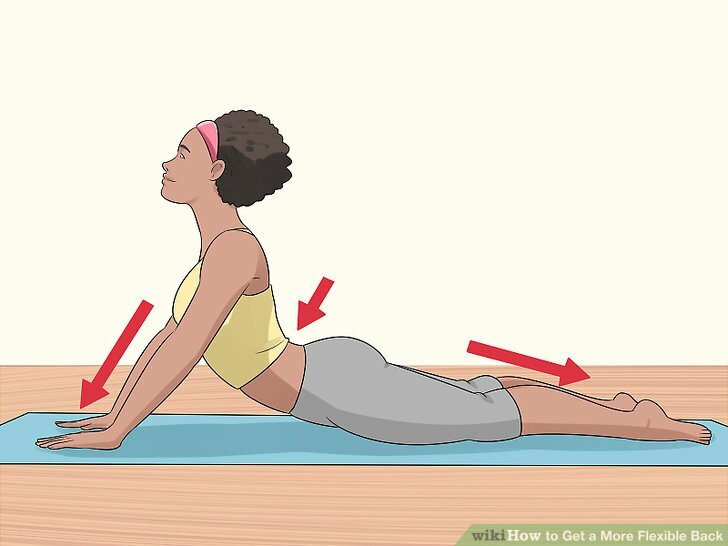 Hold this position for several breaths. On an exhale breath, bring your head down and tuck your chin to your chest as you arch your back up towards the ceiling. Hold this pose for several breaths. For an extra back stretch, slowly slide your arms forward on the mat while arching your back until you get your arms and chest to touch the ground. Do a cobra stretch. Lie on your stomach with your elbows bent and your hands by your sides. Slowly straighten your arms as you inhale, lifting your upper body, and tilt your head back towards the ceiling. Make sure your pelvis stays firmly planted on the ground. Keep your leg muscles tensed and thigh muscles contracted. Hold the position for at least 40 seconds and let your muscles stretch with the pose. Once you become comfortable with this pose, you can try bending your legs upward at the knees and reaching your head back to touch your toes. Stretch into the swan position. Kneel on the ground with your big toes touching and your heels pointed outwards apart. Walk your hands forward on the ground in front of you and keep your tailbone planted firmly on top of your feet. Once your arms are fully extended in front of you, push your forehead down toward the ground. Hold this pose for one to two minutes while you inhale and exhale. Inhaling will expand your stretch and be very beneficial for your back muscles. Stretch into camel pose if you don’t already have a sore back. While kneeling with your legs shoulder-width apart, push your hips forward and lean back until you feel a stretch. This can be done with or without supporting yourself with your hands. Place your arms behind you and reach down to rest the palms of your hands on the bottoms of your upturned feet. Pull your elbows together behind you and lift your sternum up toward the ceiling. This will open up your chest and initiate a nice stretch in your back. If you cannot sink backwards enough to reach your heels, use an exercise ball, yoga block, or other props to support your back. Keep your back straight while you attempt a pike stretch. Sit on the floor with your legs straight in front of you. Start by reaching your arms upwards toward the ceiling. Gently lean forward and reach towards your toes. This stretches the hamstrings, leg muscles, and the lower back. The goal is not actually to reach your toes, but to straighten and lengthen the back. A mistake in form is to be focused on the feet rather than the back. This is a back exercise, not a foot-grabbing game. Use props to get the form proper. Thera bands, rolled up towels, and belts can all be wrapped around the feet to get into a modified form. As an alternate method, you can try the pike stretch from a standing position. While standing erect, bend forward at the waist and reach towards the ground. Bend forward far enough to feel a comfortable stretch in the back and legs. Lean into the mermaid stretch. Sit on the floor with your knees bent and your legs tucked underneath your body to the left side. Hold onto your ankles with your left hand and raise your right arm. On an inhale, extend your right arm over your head and reach toward the ceiling. Exhale your breath and feel the stretch in your torso and back muscles. Hold the pose for 20-30 seconds, then repeat the movement several times. Be sure to switch sides, with your legs under your body to the right and your left arm extending over your head. Strengthen your back with a bridge stretch. Lie down on your back with your knees and arms spread shoulder-width apart and push your hips up toward the ceiling. Bend your knees and place your feet flat on the floor. Plant your hands on the ground just above your head and use your arms and legs to lift up your body as much as you can comfortably lift it. Hold this position for several minutes while you breathe in and out. 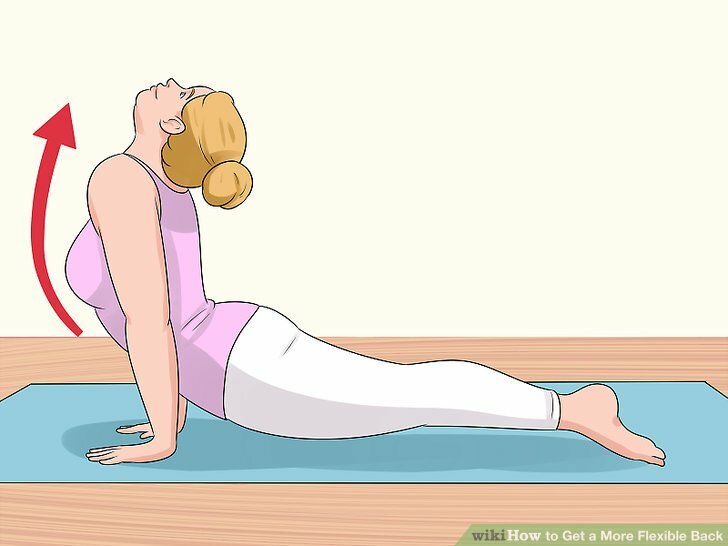 If desired, you may place a support prop, such as a yoga block, underneath your buttocks to help support your body in this pose. However, doing this will eliminate or reduce the strength component of this exercise. Try a standing split stretch. 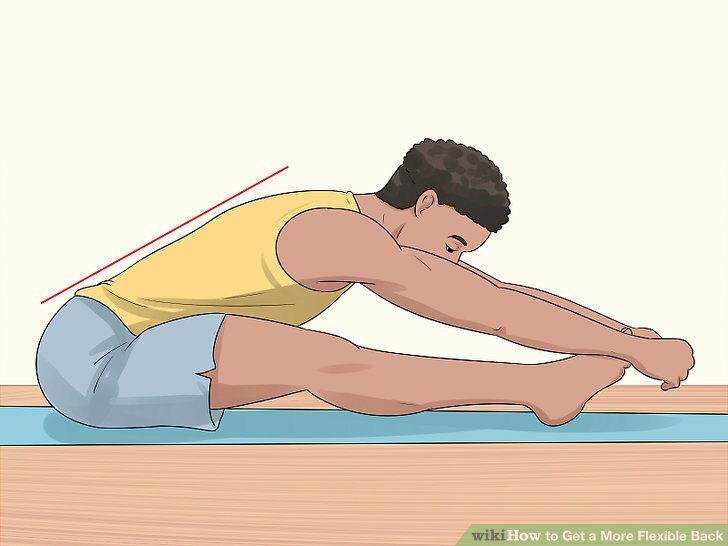 Go down on your left knee and place your right foot straight in front of you, as if you were doing a cheat version of the splits. Touch your right foot with both hands and then try to touch your knee with your forehead. Hold this pose for at least 15 seconds. Bring your left arm over your body and try to touch your right foot. Hold this position, then turn as far as you can to the right and hold again. All of your muscles work in tandem together – so stretching your other muscles (like your leg and core muscles) will help improve back flexibility. Having a strong core will allow you to work on your back flexibility by being able to engage in more poses and stretch further into your poses. Work your way down to floor splits. Go into a lunge position and push your pelvis down towards the ground. If you feel pressure or pain, lessen the degree of your lunge. Sit back onto your bended knee and stretch out your front leg. Try to put your forehead to your front knee – you should feel a stretch in your hamstring. From this position, try slowly going down into the splits. Go down as far as you can without hurting yourself and hold this position for 30 seconds. Adjust the stretches to suit your specific needs. Remember that all of your muscles work together to make one strong body – so a flexible, strong back requires flexible, strong muscles in other parts of the body as well. If you can’t quite get down into the splits or reach all the way to your toes, that’s fine. The more you practice and work on your stretches, the more flexible you’ll become. Don’t try to force yourself too hard into stretches you can’t handle. You don’t want to injure yourself.